In Texas, the tale of the Alamo is a familiar one and the names Bowie, Crockett, Travis, and Houston are as well known as Washington and Lincoln. The image of the Alamo defenders stepping across the line drawn in the sand is etched into your brain and you learn the phrases "Come and Take It," "Victory or Death," and "Remember the Alamo!" at an early age. 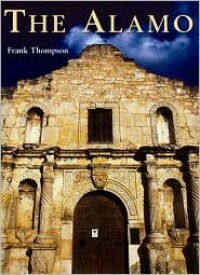 As a native Texan and history lover, I'm naturally drawn to stories of the Alamo and the fight for Texas Independence, so when I saw this version of The Alamo by Frank Thompson at the used bookstore I scooped it up. At the time I didn't realize that the novel is based on the screenplay for the most recent movie of the same name. It definitely has the feel of a movie, with brief caricatures of dozens of various characters, and with the exception of perhaps Davy Crockett, none of them feel fully fleshed out. When you pick up a novel about the Alamo, it's a lot like reading about the Titanic, you already know how the story will end, so it's really all about the characters. I liked that the author included many sides to the battle and offered so many different perspectives, from the native Tejanos, the Mexican soldados, the Alamo fighters, the founders of the republic, etc., and that he extended the story to the surrounding battles at Goliad, Gonzales, and ultimately San Jacinto. I wanted meatier character development, but then I guess the novel would actually be the size of Texas. The battle of the Alamo was a 13 day siege, so the first half of the book works to build tension and once the action ramped up at around page 250, I was so engrossed in the battle that I stayed up half the night to finish the book. I think it's important to remember that this isn't just the stuff of movies. Whether courageous or foolish, these were real men fighting for a place to call home. When I visit what's left of the Alamo mission in San Antonio next month, the experience will be all the more intriguing and haunting.